If you are familiar with the Walkinstown Roundabout turn onto St. Peter’s Road which is also known as the R122. Pass the Credit Union on your right and when you reach an Esso Service Station on your left, you will see traffic lights. Turn right here into Limekiln Lane [L8292] Continue to the church. If you are coming from the City Centre follow the directions for the N81, the Tallaght- Blessington Road, which will bring you through Terenure. Just before Templeogue Village there is an intersection with the R112. Turn right here and continue to a roundabout and take the second exit. 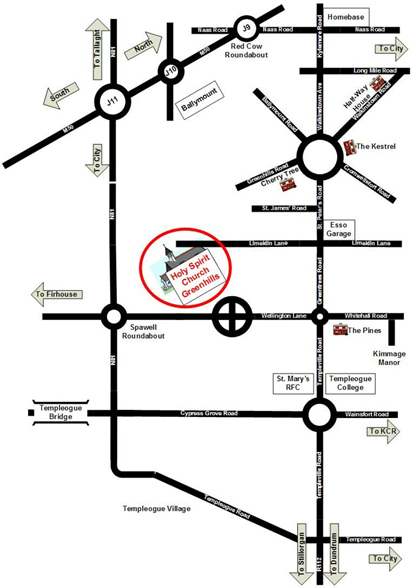 You will then pass St. Mary’s RFC on your left and Templeogue College on your right. Continue to the next roundabout and take the second exit. You are still on the R112. You pass a set of pedestrian lights and then reach a crossroads controlled with traffic lights. You will see an Esso Service Station on the right. Turn left into Limekiln Lane, [L8292] and continue to the church. If you are coming from South County Dublin turn off the N11 at Foster’s Avenue. This is the R112. Pass through Dundrum and Churchtown. Eventually you will cross the Terenure-Rathfarnham Road. Continue with the River Dodder on your right. Shortly you will pass the Rathfarnham Shopping Centre on your left. Continue on the R112 and you will cross the N81. Proceed to a roundabout and take the second exit. You will then pass St. Mary’s RFC on your left and Templeogue College on your right. Continue to the next roundabout and take the second exit. You are still on the R112. This section is called Greentrees Road. You will pass a set of pedestrian lights and then reach a crossroads controlled with traffic lights. You will see an Esso Service Station on the right. Turn left into Limekiln Lane, [L8292] and continue to the church. If you are coming on the M50 use the Ballymount or Tallaght Exits. Please see the diagrammatic map above. The Tallaght Exit is probably the better. Turn on to the N81 heading to the city. Pass through Templeogue Village and when you come to the crossroads where the N81 meets the R12, turn left Proceed to a roundabout and take the second exit. You will then pass St. Mary’s RFC on your left and Templeogue College on your right. Continue to the next roundabout and take the second exit. You are still on the R112. This section is known as Greenhills Road. You pass a set of pedestrian lights and then reach a crossroads controlled with traffic lights. You will see an Esso Service Station on the right. Turn left into Limekiln Lane, [L8292] and continue to the church.